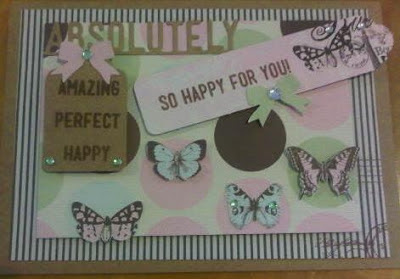 My first finished card of 2013! This one was requested by my friend Alex, for a wedding. I even got to use my xmas gift - a cuttlebug! I used Kraft card, Kaisercraft papers (I cut-out the butterflies), tag and ribbon punch, 'Absolutely' die with matching stamps (from Simon Says Stamp; a memory box set), 3 different foams (for different heights), brown ink, and silver and green rhinostones.